Now and then, a "Bits & Pieces" post shares scrapbook items that don't fit neatly within posts about the Howe-Salyers family. Still, the random photos, cards, and clippings must have been important to the family. They may still be important to readers who had ancestors in Carrollton, Kentucky and nearby communities. This post includes a lot of names and faces. 1. Can You Identify The Women? The Buildings? This image, cut into sections, features 27 women who appear to be in their teens or early 20s. A high school class? A social organization? A group of office workers? Written on the top section: A date: "Oct - 24 - 1923"
A sign on a building in the background: "J.P. Taylor Co." A web page of the Library of Virginia reveals that the company was connected with Universal Tobacco Company, a major player in the tobacco industry during most of the 20th century. The company was based in Richmond, Virginia, with offices in other places, including Carrollton, then a major tobacco market. There is no mention of a company location in Indiana. Based on these factors and the hometown of our scrapbooker Sarah Eva Howe Salyers, I think chances are good this image was taken in Carrollton. Can you provide the names of anyone in the photo or identify the location? UPDATE: A Facebook viewer, Carolyn Williams, identified the building as the original Carrollton High School on Seminary Street, where the middle school is now. Thank you, Carolyn. 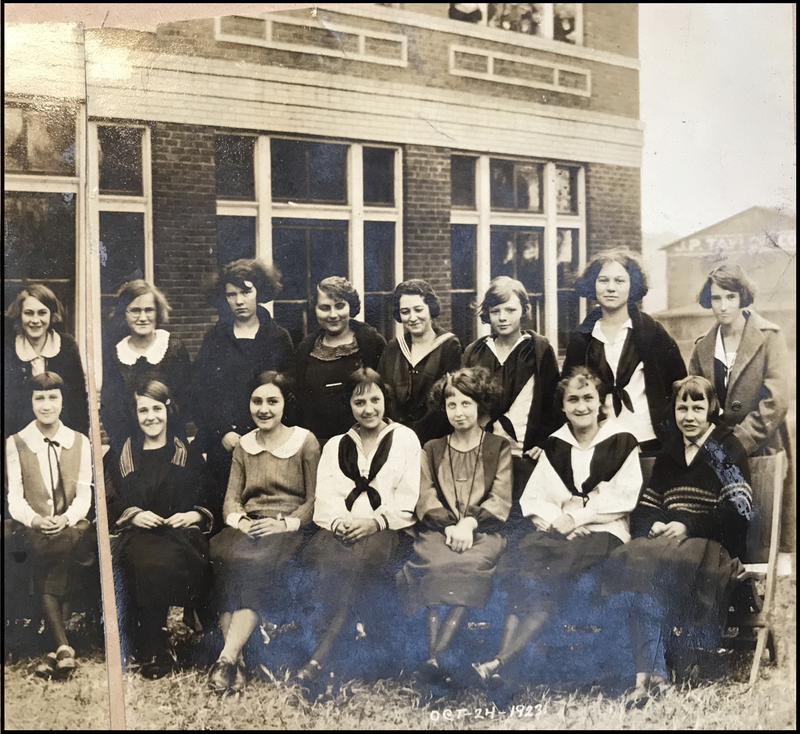 Notice below that the list of 1923 Carrollton High graduates includes 11 girls. Could they be in this photo, along with other girls at the school? Imagine paying $2 for four prescriptions! Sarah Eva Howe Salyers did just that in January 1923. She also bought an atomizer for 85 cents plus four rolls of shelf paper and four rolls of crepe paper – at 10 cents a roll – for the Carrollton School PTA. 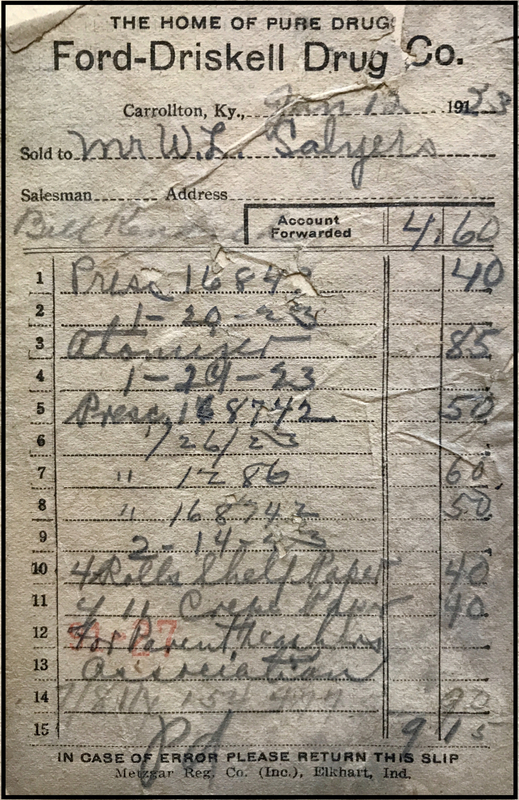 This bill from Ford-Driskell Drug Company, "The Home of Pure Drugs," tells the tale. Maybe some of you with Carrollton ties can make out the name written under the printed word "Salesman." Bill Kendall, maybe? Here is a summary of social notes from newspaper clippings (likely from the Carrollton Democrat) pasted into the same scrapbook. While the clippings are undated, they come from pages containing items from the early 1920s. Below the summaries are images of the first three articles. 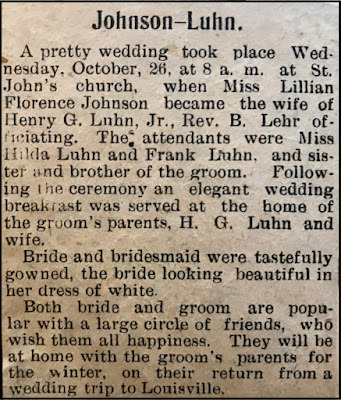 Johnson-Luhn Wedding – Lillian Florence Johnson became the wife of Henry G. Luhn, Jr. in a ceremony at St. John's church at 8 a.m. Wednesday, Oct. 26. [Oct. 26 was on a Wednesday in 1921, so that could be the year.] Officiating: Rev. B. Lehr. Attendants: Hilda Luhn and Frank Luhn, sister and brother of the groom. 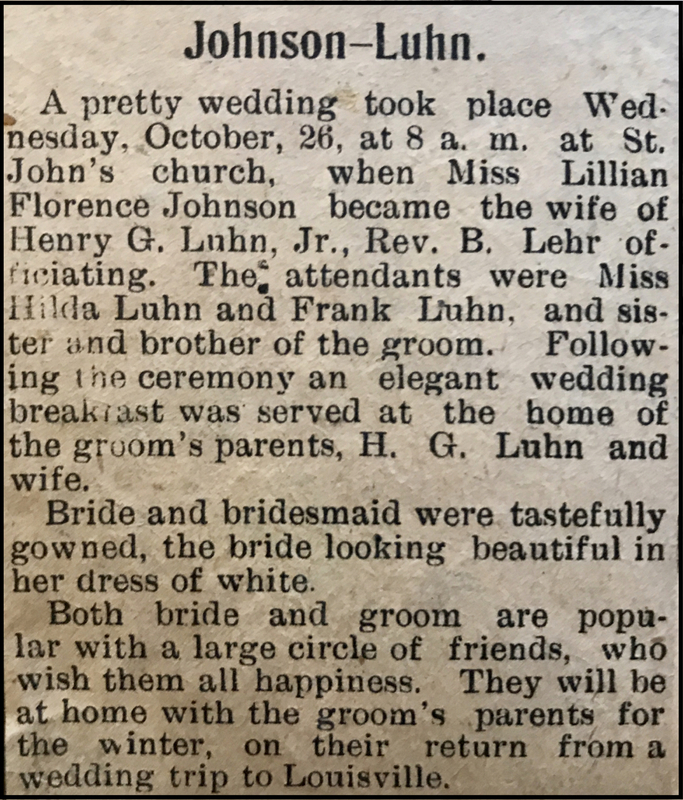 Parents of the groom: Mr. and Mrs. H. G. Luhn. of infant Charles Robert Brown. 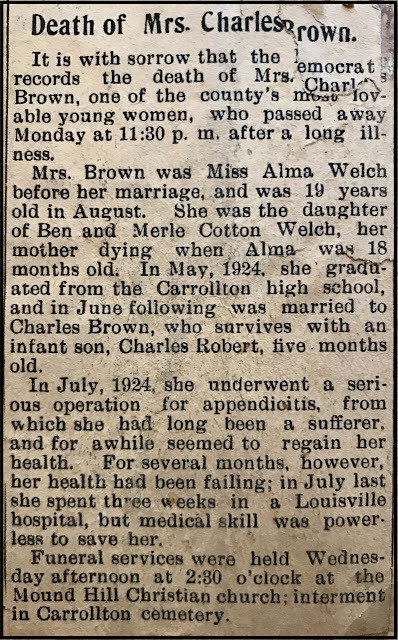 Based on date references in the obituary and a posting on Findagrave.com, I estimate that she was born in 1906 and died in the early autumn of 1925. News from Ghent: • Mrs. Oliver Tyson died at the home of her son in Madison on Friday, August 17. 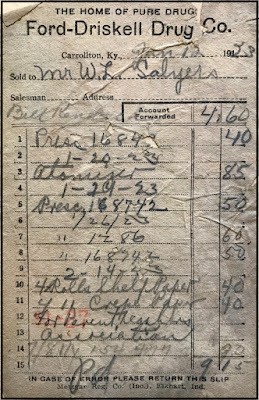 [Aug. 17 occurred on a Friday in 1923.] • Miss Carolyn Platz entertained Wednesday evening for her guest, Miss Rogers, of Covington, with a delightful garden party. • Mrs. F.B. McDonald, Misses Linnie and Callie McDonald, J. M. Bond and John L. McDonald motored through central Kentucky this week. • John Tandy is enjoying a two weeks' vacation from the bank. • Mrs. R. O. Dufour and children, after a month's visit with relatives in Geoegia, returned home Saturday afternoon. • Miss Margaret Scott entertained with a picnic supper in honor of her visitor, Miss Elizabeth Toby, of Harrodsburg. The following guests were present: Miss Wilson, from West Virginia; Miss Caroline Platz and her guest, Miss Daisy Orr, of Covington; Miss Margaret Ford, of Georgetown; Misses Martha Scott, Mariam Gex, Anna Katherine O'Neal, Mary Long and Ruth Ellis; Messrs. John Long, Will Ed and Gex Diuguid, Will Parker, John L. McDonald, J. M. Bond, Emmett Montgomery, Leslie Terry, John Heady and Victor Ellis. 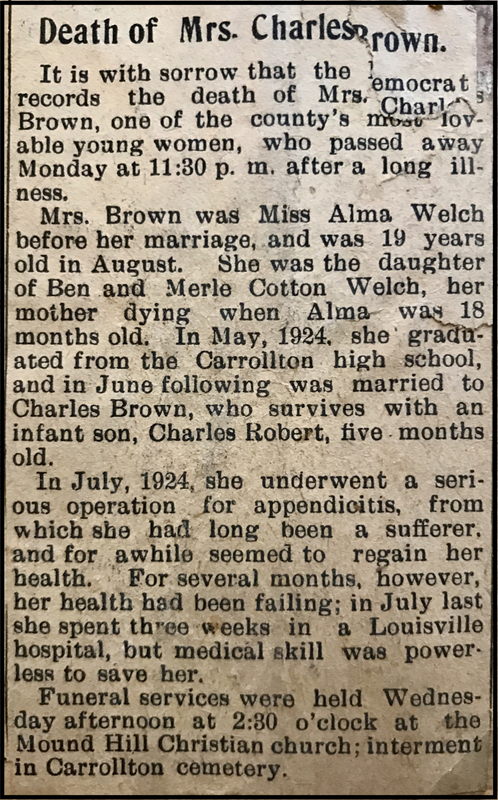 Sometimes these incidental little newspaper bits can help genealogists make family connections. I hope you found some familiar names here. While digging through the piles of scrapbooks this morning, I came across one I hadn't seen before. It is much smaller than the others and has been trapped, maybe for decades, among the larger, thicker books. "A treasure!" I thought. Sure enough, it was. 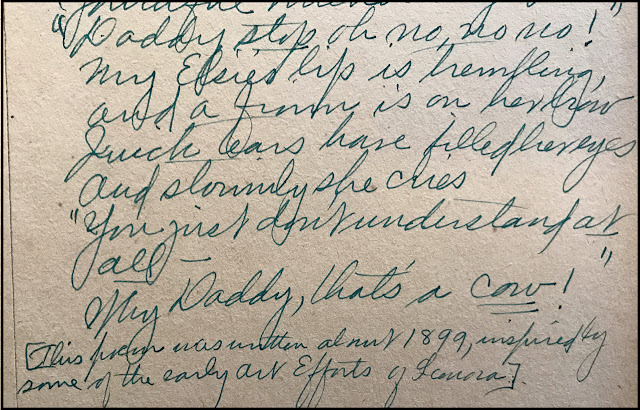 Sarah Eva Howe Salyers had transcribed into the book some of the poetry she had written between 1890 (when she was 7 years old) to 1915 or so. To preserve some of the poems for family and for all who care to read them, I am including here a few that tell family stories or offer insight into Sarah's thoughts and observations. Written the summer S.H.S. was "going on eight" and her first written-down poem. Her poem includes an asterisk leading to a footnote that refers, I think, to her twin children and their battles over toys. A little pussycat then came out. * Even at the age of seven, I was prophetic of conditions seen later in [the] Salyers family –- not only cheese. Sarah's explanation about the inspiration behind "Chalchuite," a poem she wrote at age 10. 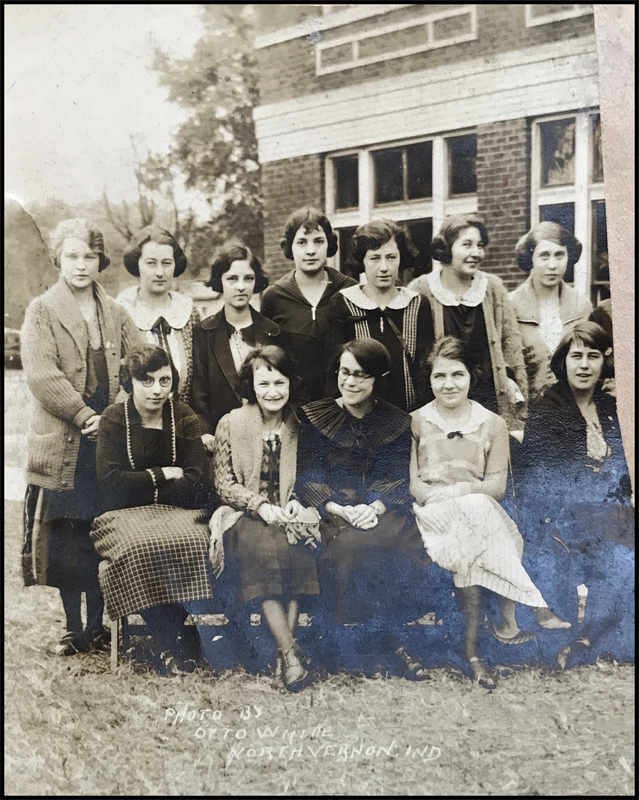 Transcription: When S.H.S. was ten, in the 4th grade, her parents talked of going to live in New Mexico, reading much literature concerning it, and especially enjoying the book The Land of the Pueblos by Mrs. Lew Wallace [Susan Arnold Elston Wallace]. 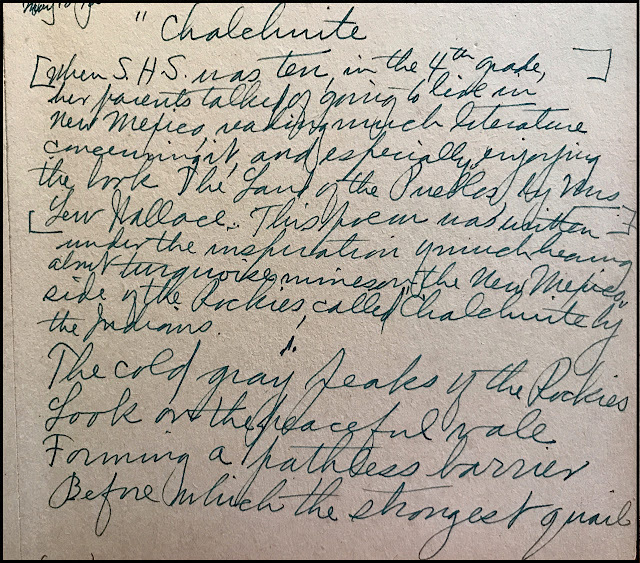 This poem was written under the inspiration of much hearing about turquoise mines in the New Mexico side of the Rockies, called "Chalchuite" by the Indians. Imagine! This family in Carrollton, Kentucky was seriously considering a move to New Mexico. 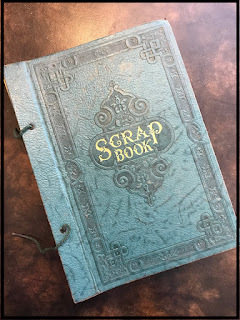 If they had gone, I wouldn't be reading Sarah's scrapbooks today – and I would likely never have met her grandson. (Note: Mrs. Wallace's book is available to read online or download free in electronic format.) An asterisk within the poem leads to a footnote that tells us more about the family. 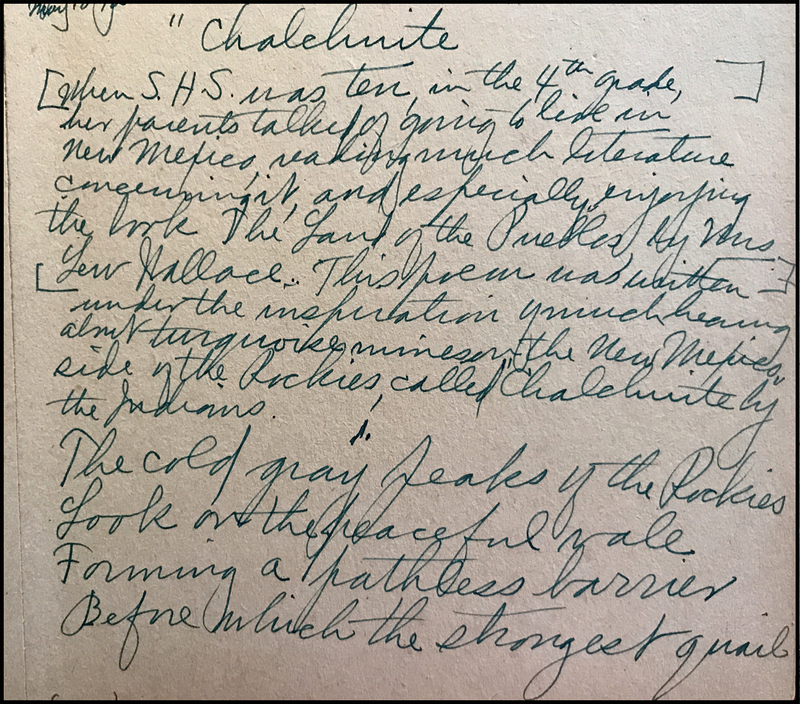 Chalchuite (pronounced chälchəˈwētē, says Merriam-Webster) is an Anglicized version of the Aztec word for turquoise, the most valued green stones in the Aztec society. Before which the strongest quail. Shrouding their tops with lace. Its country's praise has won. This land of the setting sun. * That was how we privately spoke of New Mexico, so no one would learn what we were talking about, as the idea of going there was a secret. We didn't go, incidentally. In 1894, when Sarah was 11, her pet and constant companion Solon disappeared. (I think she pronounced it like "SOLE'-on.") She wrote this poem and likely posted it in her neighborhood and maybe in the window of her father's department store. "Strayed or stolen" — a spaniel, Solon! (chicken, however, he likes the most). He's "brown as a berry" and "warm as toast"
And just think, friends, that he's lost or stolen. Oh please remember he's lost or stolen! and bring back my poor little Solon! While the woman stood beside him to admire and to praise. I see my Elsie standing, an audience demanding. Within the brown eyes starry bright the fire of genius burns. In fingers fat and fair, a pencil held with care. She waves a paper masterpiece before my dazzled sight. "I've drawn a picture. Look! Daddy, please don't ready your book! See if you know what this is — all red an' black an' white!" While these lines and curves are like the work the great Assyrians did. "Daddy, stop! Oh no, no no!" My Elsie's lip is trembling, and a frown is on her brow. "You just don't understand at all! Why Daddy, that's a cow! A poem ends with Sarah's little sister's frustration over Daddy's highbrow interpretation of her simple artwork. Continuing through the scrapbook: What fun to find a 3-stanza poem Sarah wrote as a 25th birthday gift to William Levi Salyers (the man she would marry two years later, in 1905). As noted in the blog posts of Sept. 25 and 29, 2016, William (often called Will) was known as "girl crazy" in his teens. This poem lets us know that Sarah was well aware of his popularity among young women. Sarah included Will's girlfriends by first name in her poem, and in her scrapbook she added a footnote to provide their surnames, just in case future generations wanted to know! He wasn't altogether pleased with everything, not he! And cats scratched when you played with them, and puppy dogs would bite. But when he saw a little girl, he smiled a dimpled smile. She suited him exactly his spare moments to beguile. He likes the little girls as well as when he was a baby! To take a good and honest heart and leave it such a sight! With here and there a gaping wound where Billy met his match! and each a chip or splinter as a souvenir has won. And not even Father Time can make his scarred heart whole again. In drifting smoke, in glowing coals, sweet memories of the past. There's little Peggy — his first love — and Nellie, young and true. There's Ella with the golden hair and sprightly Jennie, too. "Sweet Emily with dreamy eyes," he sees them one and all. There's Anna with the merry smile and many another yet! The comrade of advancing years, his old and faithful CAT. 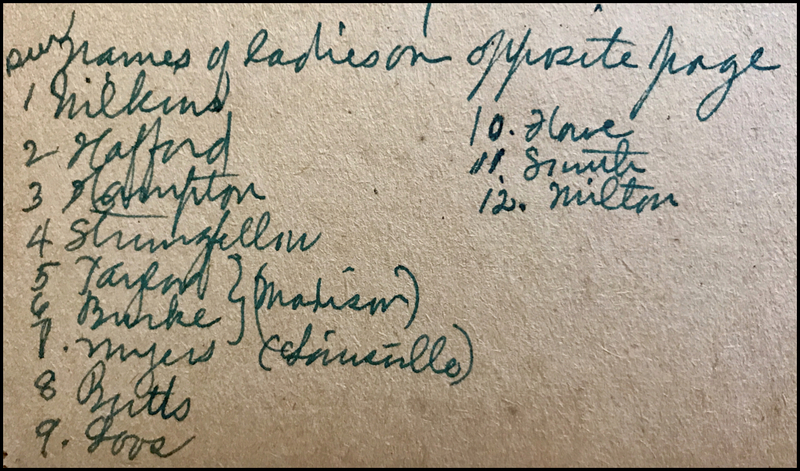 From Sarah's poem "To 'Billy,'" a list of girls dated by William L. Salyers before Sarah and Will became "an item." The book holds many more of Sarah's writings: lullabies she wrote and sang to her little sister (who, as you may recall from previous posts, was 13 years younger); a verse about a stray cat; poems she wrote as school assignments; poems she wrote after her marriage. I'll hold those for other posts. For now, I will just marvel at the creativity of this girl, who was writing complicated rhymes before her age hit double digits.